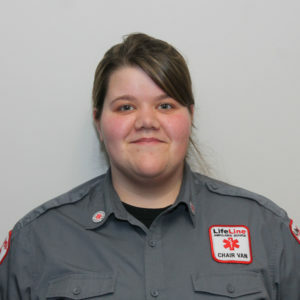 Chelsea Punty began her EMS career as a chair car driver with LifeLine in 2015. She then quickly and enthusiastically achieved certification as an EMT in 2016. Since then, she has provided superior patient care on every shift and with every patient. She is a role model to her peers in the quality of care she provides and her positive attitude. She understands that treating a patient in their most vulnerable moments is an honor, and not one to be taken lightly. Chelsea is one of our top Field Training Officers. She educates to the best of her ability, and continuously supports her peers past their training time with care, compassion, and a drive to see all in the EMS field succeed. In Chelsea’s spare time, her family comes first and is of utmost importance. She is the primary caretaker of her father, who is struggling with end stage renal failure, diabetes, and blindness. She channels this personal experience to help understand how her patients may feel, and to advocate for them when necessary. Chelsea truly knows the importance of compassion and high quality care. She never allows her personal family situation to negatively affect her role as an EMT, but instead uses these experiences to enhance her ability as a provider. Chelsea was instrumental in helping organize response to a multiple casualty incident at one of our hospitals in 2017. She is not afraid to be challenged, and takes charge gracefully. She knows and demonstrates the importance of communication and teamwork. Chelsea is a Star of Life because of her commitment to her serving her community, patients and family. She is active in community outreach and was involved in making sure that our toy drive and food drive were a success. She leads by example and motivates others to be the best they can be.